I’m a young promising leader and an entrepreneur who believes in the strengths of women, as well as their vital contribution to spur development and bring change in our dynamic societies. I was born and brought up in Kiambu County, Kenya where I live to date thus I understand the many problems be-deviling us as well as our strengths and capacities. I started my career as a casual worker in a cosmetics company in 2004, I started working in the packaging department and later at the marketing department where I worked for a period of 1 year Later. I later joined an ICT company, SDAL as a sales executive where I worked for 3 years, Later I joined Redington Gulf for 5 years as a Sales Account Manager, and later Softchoice Africa as a Territory Partner Manager till 2014. I got married in 2009 but unfortunately the marriage did not work, I was in an abusive marriage which was a very bad experience for when I came to learn I was married to a man who was threatened by my success. It took me over 3 years to be able to get out of it and finally I managed to move out , I went through a very difficult time emotionally but I am glad I walked out and was able to start a new life on my own not scared of starting life all over again. Having gotten the legal divorce in 2014, I decided I needed to do something that will help other women who were in a situation like mine, some days I had no idea how I was going to do it, but every single day I was able to accomplish something. 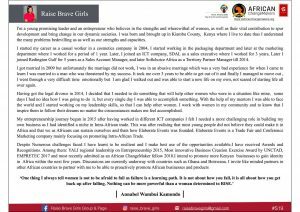 With the help of my mentors I was able to face the world and I started working on my leadership skills, so that I can help other women. I work with women in my community and to know that I inspire them to follow their dreams no matter the circumstances makes me feel accomplished. 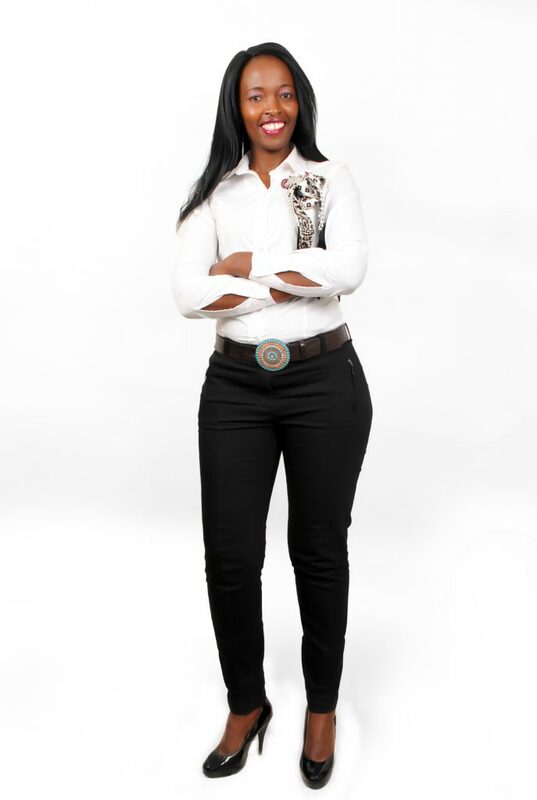 My entreprenuership journey begun in 2015 after having worked in different ICT companies I felt I needed a more challenging role in building my own business as I had identified a niche in Intra-African trade. This was after realising that most young people did not believe they could make it in Africa and that we as Africans can sustain ourselves and that’s how Elaborate Events was founded. Elaborate Events is a Trade Fair and Conference Marketing company mainly focusing on promoting Intra-African Trade. Despite Numerous challenges faced I have learnt to be resilient and I make best use of the opportunities available. I have received Awards and Recognition, among them are; YALI regional leadership on Entrepreneurship 2015, Most innovative Business Creation Exercise Award by UNCTAD, EMPRETEC 2017 and most recently admitted as an African ChangeMakers Fellow 2018 – Cohort 1. I plan to promote more Kenyan businesses to gain identity in Africa within the next few years. Discussions are currently underway with countries such as Ghana and Botswana. I invite like minded partners in other African countries to partner with me to be able to proactively promote African businesses and products. One thing I always tell women is not to be afraid to fail as failure is a learning path. It is not about how you fall, it is all about how you get back up after falling. Nothing can be more powerful than a woman determined to RISE.